New Knobs for the Yamaha AN1x! The Yamaha AN1x VA synth is held in high regard around here, and I've owned one for almost 19 years. I love the sounds I can get from it. But one of my main complaints about it is the cheap housing and knobs. A few years ago at a NAMM show I stumbled upon a DJ products booth and one vendor was giving away free samples of these mixer knobs. I took a couple of them and tried them out on my AN1x when I got home. They not only fit perfectly, but they felt really nice. Since then I've been trying to hunt down that vendor to get more of the knobs. Finally earlier this week I found them after doing a Google search. I ended up buying eight knobs for the parameter section, and the whole unit looks pretty slick. For the first time I really enjoyed twiddling the knobs on that thing. The knobs cost $1.99 each can be found here: https://store.djtechtools.com/products/ ... and-faders -- make sure you order the "Super Knob" type. These also work for the CS1x as that synth also has a similar casing. You can even get them in various colors if you want. Re: New Knobs for the Yamaha AN1x! Thanks fot the tip mate! Thank you for pointing this out. A perfect solution. Nice. 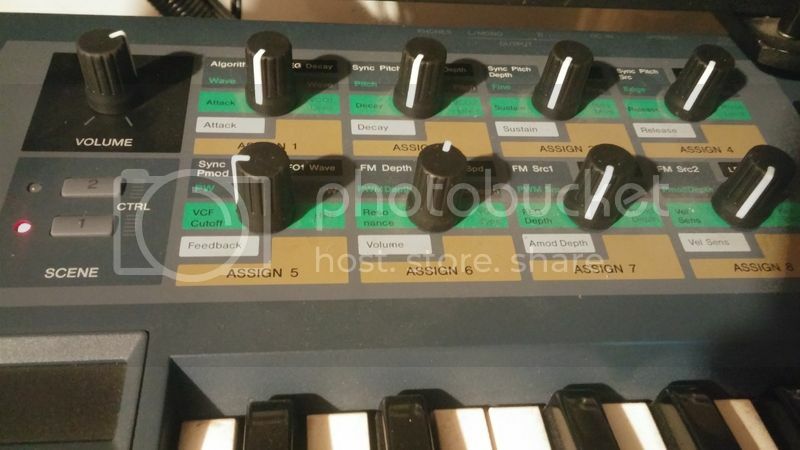 I've got a set of grey Elektron knobs on my AN1x. They feel much better than the hard plastic ones it came with.